Fall is the ideal time of the year for planting peonies. Addition of organic matter to the soil is always useful and advisable. Peonies should be spaced 90–120 cm apart in the garden. Set peony roots into the soil at a depth of 2–3 cm, making sure the eyes are facing the skies. Gardeners in the South looking to plant early-blooming peonies should wait until fall end, set the roots at a depth of 1 inch under the soil and remember to provide them some cover against the sun. Pack the soil firmly around the roots and water well. Check on the plants regularly as they’re developing and irrigate whenever the soil appears to be drying up. Peonies rarely require division and don't like root disturbance. You can enjoy your peony plants in the same spot for decades, but you can move or divide them if necessary. Digging up peonies is best done after the foliage begins to die back in fall or in early spring. Lever the peony plant out of the ground with a fork or spade. Shake the plants gently to remove the soil from the roots. Locate the buds (eyes) on the roots and cut apart the clump with a sharp knife or sharp spade with each section containing two to five buds. When planting the divisions, the eyes of the root should be planted facing upward, no more than 1–3 cm below the surface of the soil. For best results, peonies should be fed in spring, and again halfway through the growing season. Use a low nitrogen fertilizer (like our 5-10-5 Food for Bulbs and Perennials fertilizer). Do the first feeding when the stems are about 5–8 cm high. Peonies that are over fertilized often develop poorly and produce few blooms. A fertilizer with too much nitrogen is particularly harmful. Peonies require extra potassium (the ‘P’ in the fertilizer contents) for stem strength and disease resistance. 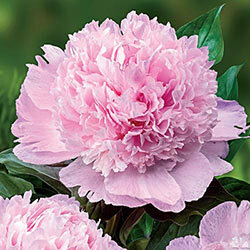 Peonies may not bloom the first spring after planting. It may take a year for them to settle in. By their third spring they are maturing and producing an abundance of flowers. Newly planted bare root peonies will establish new feeder roots when you plant them in the Fall. The winter freezing temperatures will not affect the roots, peonies like the cold. Peonies planted in the fall will establish much faster than spring planted ones. Double - Consists mostly of petals, almost no stamens. Semi-double - Five or more outer guard petals with a center of smaller inner petals. Bomb - The stamens of this flower are completely transformed into inner petals. These inner petals are narrower than the outer guard petals so that the flower looks like a sculpted ball of ice cream on a shallow bowl. Anemone - The stamens of this flower are transformed into petaloids - small, narrow petals the center of the flower - surrounded by the outer guard petals. Japanese - Five or more guard petals arranged around a large center filled with carpels and stamens. Stamens are transformed into stamenoids which are similar to stamens in form and color but have a lumpy texture and thicker tissue that prevents them from shedding pollen. Single - Five or more guard petals arranged around the carpels and pollen-bearing stamens. What is an Itoh Peony? An Itoh Peony (or Intersectional Peony) is a cross between herbaceous and tree peonies. It has a woody base and stems that are more compact and sturdier than bush (herbaceous) peonies. The large, mostly semi-double flowers sit right on top of the foliage. They usually bloom after the bush peonies. Harvest peony flowers for bouquets when the flower buds show the first signs of opening up. If they’re still as hard and round as a bullet they will not open fully. Cut the stems at an angle. Fill the vase with fresh, cold water.